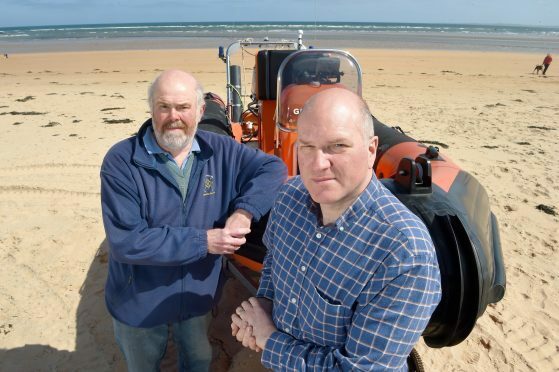 The future of a north lifeboat service is in doubt after three crew members left in a fortnight. East Sutherland Rescue Association (Esra) chairman Neil Dalton said the group is now at crisis point with just eight crew members left – and one more volunteer could be leaving. He said that a minimum of five crew – three on the lifeboat and two for the inshore launch – are needed for a typical call out but not everyone is always readily available. The dwindling numbers are a result of increased work commitments by volunteers both within and outwith the area. Mr Dalton explained that two of the volunteers to recently leave have moved south to England with work. He said: “I would say it is at crisis level. I have been there from day one and the most crew members we have had is 19, and the lowest is where we are at now. We would like to have at least 15 volunteers. Ideally we would like 20. “It’s a life saving organisation and, if people don’t come along and volunteer, I am very concerned we are going to stop. Mr Dalton added that the only time in the past they have never been able to launch is when the seas have been too heavy to get off the break. The service first started in 1992 as an independent inshore lifeboat and. The lifeboat, called Glen Cassely, is kept at the boating shed at Dornoch beach car park. In July and August of 2015 the lifeboat was involved in a major sea, land and air search for missing Dornoch man Lachlan Simpson, whose body was found about a month later at an Aberdeenshire harbour. More recently, the lifeboat was called out on Good Friday to assist a yacht in difficulty at Loth, just south of Helmsdale. Anyone willing to volunteer will be required to attend at least two training sessions each month, held either on a Wednesday or Sunday evening. Full training is provided to a minimum level of Royal Yachting Association Power Boat level 2. Training in both radio procedures and first aid is also given and the association provides all members with full personal protective equipment including dry suit, lifejacket, helmet and gloves. Anyone willing to volunteer their help or seeking further information should contact Gareth Dixon on 07775641616 or Antony Hope on 07710301387.